Autumn is coming at us faster than you can say ‘pumpkin’! Soon, we will be sporting our favorite sweaters, boots, and jeans. The leaves will change colors and we will start cooking warmer, heartier meals. Today, we have a simply, inexpensive, yet delicious recipe. 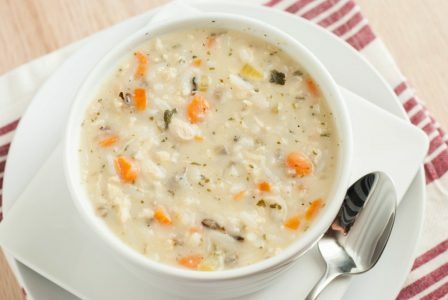 This tasty recipe for chicken and Wild Rice Soup is a copycat version of Panera Bread’s Chicken and Wild Rice Soup. Give it a try! In a large pan over medium heat, melt the coconut oil. Next, add the onions and carrots and cook them until they begin to soften. Add the dried marjoram, flour, and seasoning packet from the rice. Stir everything together and then add the rice, chicken broth, and water. Bring it to a boil. Then, put a lid on top and simmer the ingredients for approximately 15 minutes. In a small pan, mix the heavy cream with the milk and heat it over low heat. Next, stir it into the main soup pot and add in the shredded chicken. Continue cooking until the rice is finished cooking (approximately 3o minutes). Add salt and pepper to taste and enjoy!